At the end of the 9th century, many of the separate kingdoms of what we now know as England have fallen to the invading Danes, leaving the great kingdom of Wessex standing alone and the defiant under the command of King Alfred (David Dawson, Peaky Blinders). 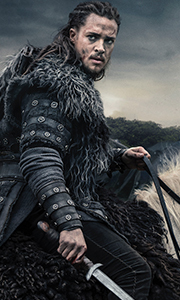 Against this turbulent backdrop, Uhtred (Alexander Dreymon, American Horror Story) is born the son of a Saxon nobleman, yet captured by the Danes and raised as one of their own. Cho..
Own The Last Kingdom Season 2 Blu-Ray from Deff, DVD, Blu-Ray & 4K Video Specialists - Free UK Delivery..